The latest incarnation of Delving Deeper has been released, free in PDF format. There will be a hardcover forthcoming. Delving Deeper is a very nicely done OD&D retro-clone, here is the forum post announcing the release, which gives a bit more detail. 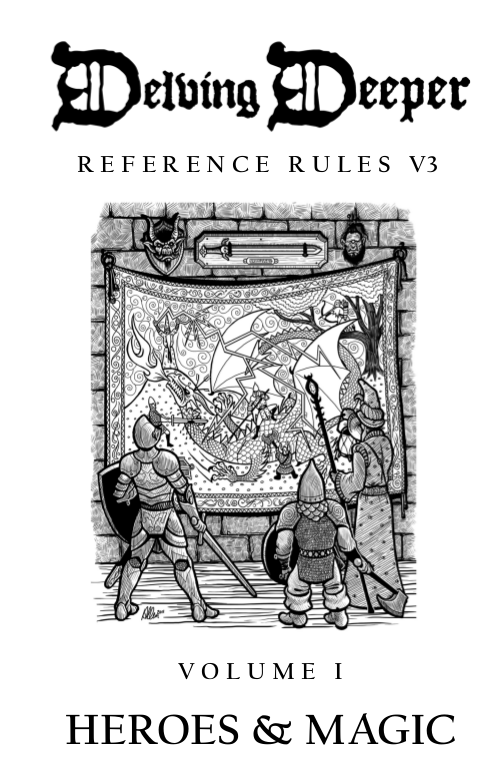 I’ve been playing in a Delving Deeper play-by-post game using what was a beta version of these rules, it is very nicely done and distinguishes itself from some of the other 0e clones by being as close to the originals as possible. Given the ambiguity in some of the original rules, I think Simon Bull has done a terrific job on the new revision. It is what three “Little Brown Books” OD&D could have been if the references to Chainmail and Outdoor Survival were spelled out, rather than being just mentions in the text.